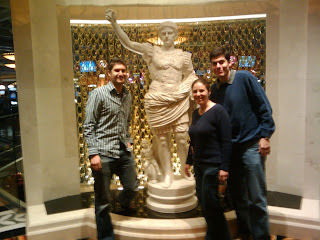 We hit Atlantic City this year on Christmas Eve. It's not exactly the traditonal Jewish Christmas Eve of Chinese Food and a Movie - but it's pretty close. As Shira said in a text message to me about her Black Jack table: "Could have minyan at my table"
I was also reminded by Shira that tonight is the 15th anniversary of our first date (which took place at Ho-Ho Chinese restaurant). Amazing. I'm sure glad that date went as well as it did. Hope she won enough to pay for dinner or better yet the vacation. Did you go to the sub place Nate told you about for the best tuna in Atlantic City?